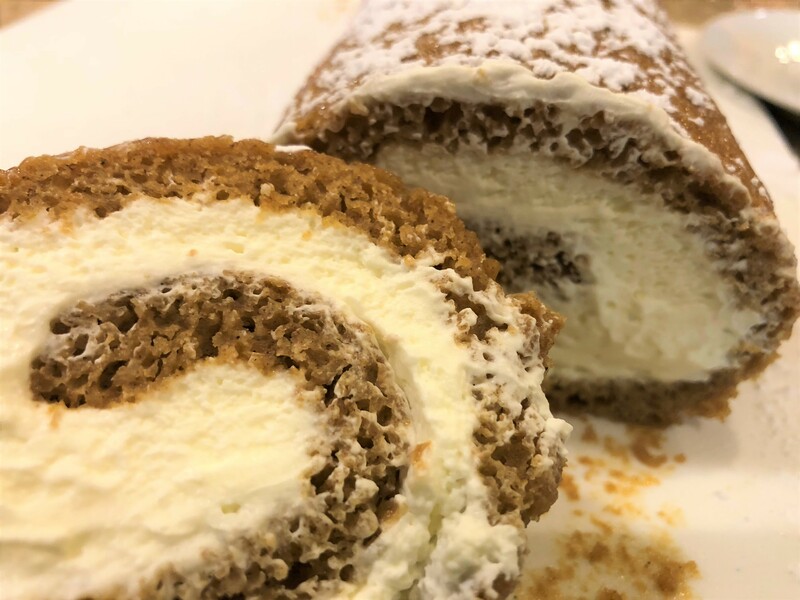 This Pumpkin Roulade Recipe (also knows as a Pumpkin Roll) has been a favorite around our house and the Bed and Breakfast Inn for awhile now. Don’t be afraid of a cake roll, it’s actually really easy. The whole thing only takes about 30 minutes of prep time, and it bakes in 10 minutes! It’s a great dessert to make a day ahead of time and the presentation is beautiful! This recipe, and 499 others can be found in our cookbook, “Rocky Mountain Lodge & Cabins MORE Favorite Recipes“, and can be purchased HERE. Preheat oven to 375°F. Grease and flour a 17"x12" rimmed baking sheet. Line with parchment paper, and grease and flour the parchment paper. In a small bowl, sift together the flour, cinnamon, ginger, nutmeg, baking powder, baking soda, and salt. Set aside. In a large mixing bowl, combine eggs and sugar. Beat at medium-high speed for 3 minutes. Add pumpkin, melted butter, and vanilla extract, beating until incorporated. Add the flour mixture, beating at low speed until incorporated, scraping down sides of bowl as necessary. Pour batter into prepared pan, and level with an offset spatula. Bake until a wooden pick inserted in the center of the cake comes out clean, about 10 minutes. Dust cake well with powdered sugar. Lay a clean dish towel over cake in pan. Place a wire rack over dish towel. Invert cake and towel onto wire rack. Starting from a short side, immediately roll up cake with dish towel, jelly-roll style. Let cool on a wire rack, seem side down. When cake has cooled, gently unroll it, and remove dish towel. Spread with Vanilla, Butter and Nut Whipped Cream. Re-roll cake, and place seam side down on a parchment-lined baking sheet. Cover, and refrigerate for 4 hours. Dust cake again with powdered sugar, and cut into slices, using a serrated knife. In a medium bowl combine cream, powdered sugar, and flavoring. Beat at high speed with a mixer until stiff peaks form. Cover, and refrigerate until needed, up to 8 hours. Makes 3 cups of cream.